Horticultural Services to the Houston Metro Area. At Green Thumbs of Texas it is not about us it is about you! Our specialty is serving you. At Green Thumbs of Texas, we specialize in providing excellent horticulture service for your building, facility or home. Our professional horticultural staff that is second to none. Our technicians and salespeople undergo ongoing training to stay on top of new varieties of plants, as well as best practices in caring for your indoor plants. Quality plants for quality interior landscape. 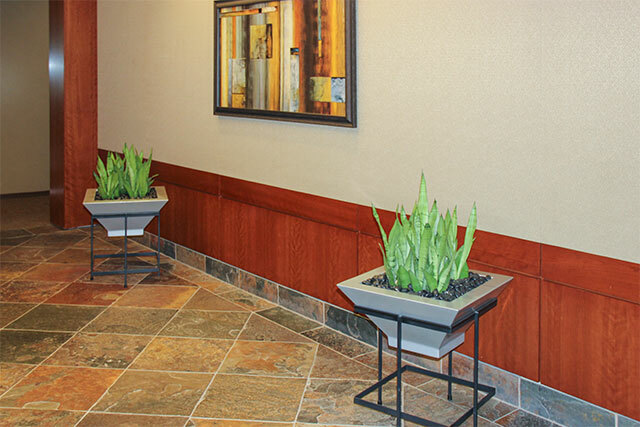 We use the highest quality plant material on all of our interior landscape projects. Our plants are grown in Hawaii, California, Texas, and Florida, and are shipped to us weekly so that you have the freshest brilliant tropical foliage that is available. We use plant material that is properly acclimated to lower light conditions before they are put into your environment. This ensures that the plants will have the least amount (if any) of shock or adjustment. We pay attention to the details of designing, installing, and maintaining your interior plants so that you won’t have to. Contact us today for your Free Interior Landscape Consultation. Let us take care of the details for you. Bill Phillips, owner of Green Thumbs of Texas, is a graduate of Sam Houston State University in 1987, with a Bachelors Degree in Horticulture/Crop Science.